Featuring three-dimensional audio formats Dolby Atmos, DTS:X and DTS Virtual:X, the Denon AVR-X3500H, available in Winnipeg at Creative Audio, powers exceptional home theater. The Denon AVR-X3500H supports the latest video technologies Dolby Vision, HDR10, HLG and 4K Ultra HD. An advanced HDMI section (8 in/3 out) supports HDCP 2.2 processing on all ports and Enhanced Auto Return Channel (eARC). Stream Spotify, Pandora, Tidal and more with HEOS built-in or Bluetooth. Features Amazon Alexa voice compatibility, an award-winning Denon Setup Assistant and provides a seamless setup experience with advanced remote monitoring suite. Ideal for custom integrations and enthusiasts alike, the Denon AVR-X3500H features “ihiji Invision” remote system management technology and “Domotz Pro” remote monitoring and management technology reduced downtime. Featuring high current discrete power output devices on all channels, the Denon AVR-X3500H delivers high power and is rated at a maximum of 105 watts per channel (8ohms, 20 Hz ~ 20kHz, 0.08% THD). There’s also an Auto Eco mode that adjusts the maximum power available according to the volume level as well as an on-screen Eco meter that lets you see the power consumption reduction in real time. 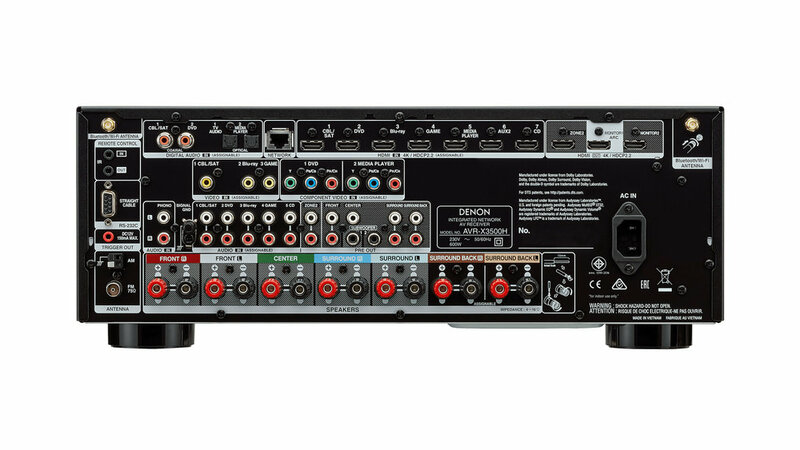 Are you interested in the Denon AVR-X3500H? Thank you for your interest in the Denon AVR-X3500H! One of our team will be in touch with you very soon.